Welcome to your new home in the highly desirable Peppertree Community of East Costa Mesa adjacent to the Upper Backbay area of Newport Beach. Your interior living spaces are sophisticated & modern - tastefully accentuated by vintage design elements. The interior location & orientation of your new home allows for both a maximization of natural lighting & privacy. 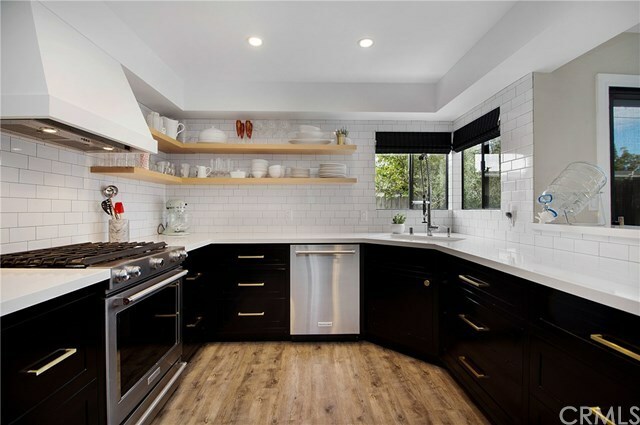 Recent updates to your new home's kitchen include: luxury vinyl tile flooring, a subway tile backsplash, white quartz countertops, floating Alderwood shelves, custom hand-crafted cabinetry with Birch interior finish & soft-close drawers, Schoolhouse Electric natural brass hardware, a cast-iron undermount farmhouse sink, & LED lighting. All of your bathrooms have been updated. Updates to the master bathroom include: black limestone flooring, marble shower tile, a custom glass enclosure, a Restoration Hardware marble top vanity, mirror, sconces, towel bar, etc. Your mainfloor powder updates include: luxury vinyl tile, subway tile backspash, marble countertops, designer mirrors & antique faucet/hardware, & custom handcrafted cabinetry with birch interior & soft-close drawers. Additionally, your new home also has fresh paint inside & out, a water heater less than 2 years old, solid wood doors in both bedrooms, the powder & the master bath. The patio/yard area has also been redone to include both natural stone & high-end synthetic turf.